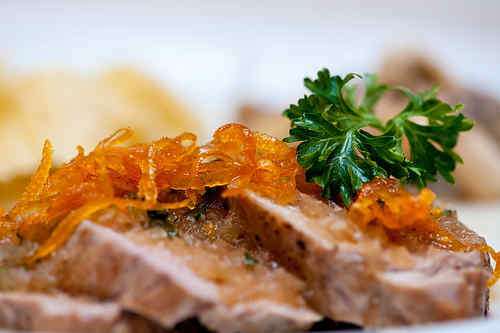 Here my recipe for pork tenderloin with orange sauce, garnished with fresh parsley and orange zest confit. It uses the same ideas as the typical Duck a l'Orange recipe to get a lot of orange flavor into the dish. Combine 4 oz / 125g sugar and 1 cup / 250ml water in a heavy saucepan and bring to a boil. Add the orange zest and simmer until about one half of the liquid is left. Strain, set aside the orange zest. Combine the vinegar and 2 oz / 60g sugar in a heavy saucepan. Set over medium heat, reduce until the mixture turns syrupy. Add orange juice and chicken stock. Season the pork tenderloin with salt and freshly ground pepper. Set pan over high heat, add vegetable oil and cook the tenderloin until well browned from all sides. Remove from pan and set aside. Reduce heat. Add onions and garlic to pan, cook until the onions are soft and translucent. Add Grand Marnier, cook for a minute or two, then add the mixture of sugar, vinegar and orange juice. Return tenderloin to pan. Season the sauce with salt and pepper, add chopped parsley. Slice the tenderloin. Garnish with orange zest and fresh parsley. The orange sauce and zest is inspired by the "Duck a l'Orange" recipe in . Came to you today via your listing on the foodie blogroll. You do beautiful work! Great dish. Thanks for sharing your recipe.